Le Châtelat can host your special occasion. The luxury and magic of our service and residence will ensure your wedding day is truly unique. Although beautifully appointed with French antiques, all modern conveniences are up to the minute. We provide seamless service and welcome guests to the opulence of the library, the drawing room, the conservatory or on sunny days in the landscaped gardens with swimming pools and water features. The ceremony can be held in our beautiful garden under the pavilion. Le Châtelat has a number of different areas to customize your wedding reception. Photo opportunities abound for the bridal retinue. Honeymoon packages and guest accommodation are available upon request. 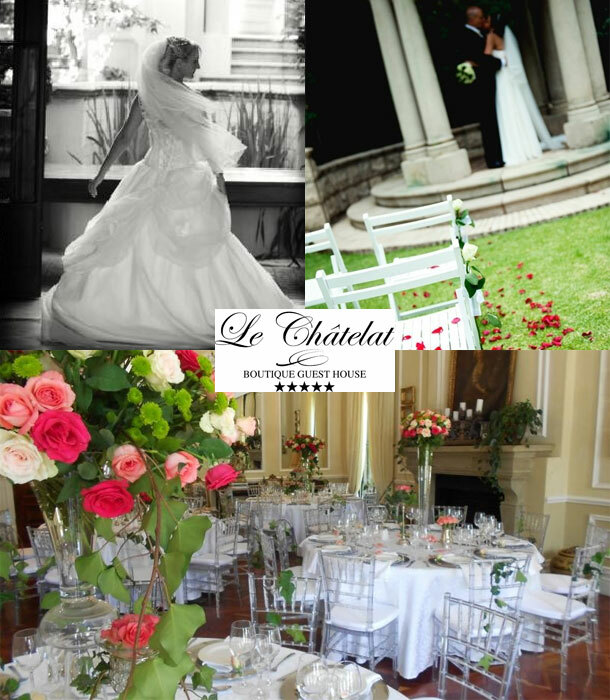 To book your wedding and this gorgeous venue visit Le Châtelat Boutique Guest House.